USGBC has announced it will begin recognizing wood from American Tree Farm System (ATFS) certified forests by creating a new path to earn a LEED credit. The U.S. Green Building Council (USGBC) has from its early days strictly limited the sources it would recognize for sustainable wood in homes and buildings it certifies as green. USGBC is the governing body for the Leadership in Energy and Environmental Design (LEED) standard used to certify most of the green buildings in the United States. The LEED system gives credit points for various building materials and practices, including sustainably grown and harvested wood products. FSC, a competitor to ATFS, was an early partner and resource for the nascent USGBC. Since that time, only FSC-certified wood could be counted for LEED credits. FSC's effective monopoly on wood for LEED buildings has no doubt contributed to its growth. FSC boasts of its 35,483,824 acres certified in the US. Most of it is commercial tree farms. As USGBC's influence grew, its refusal to recognize sustainable wood from other certification systems (like SFI and ATFS) increasingly upset timber growers, sawmills and builders. Those days are ending. The American Forest Foundation (AFF), its partners and many Tree Farmers have for years advocated for this change. This is an exciting breakthrough on a key issue for family forest owners, ATFS wrote in an e-mail today, and USGBC's announcement should significantly expand markets for family landowners and their efforts to protect and enhance the clean water, wildlife habitat and sustainable wood supplies that come from family-owned forests. The American Tree Farm System is a program of the American Forest Foundation. 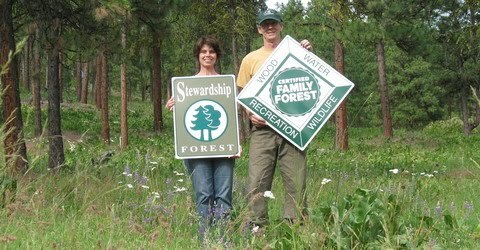 ATFS is a network of 82,000 family forest owners sustainably managing 24 million acres of forestland. Close to half the forest in the United States (441 million acres) is classified as "Family and Individual" ownerships (i.e., not corporate), according to ATFS. 2016 marks the 75th anniversary of the American Tree Farm System. Our land is an ATFS certified sustainable forest.